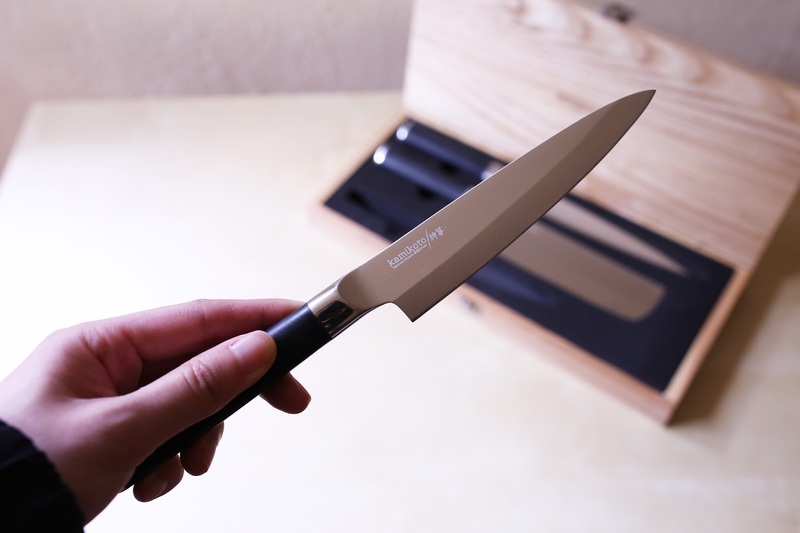 I am extremely excited to try out this beautiful Kanpeki Knife Set from Kamikoto 神箏 , who is a maker of knives with high-grade Japanese steel from the Niigata Prefecture, Japan. 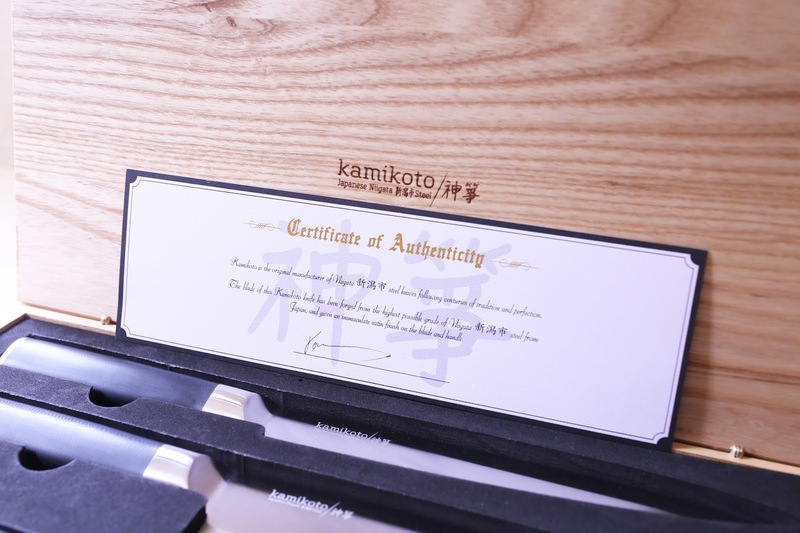 The company Kamikoto is so confident in their knives that they even provide a limited warranty for lifetime for their customers. Cutting ingredients is never my favorite thing to do, but I finally understand how a good knife can change so much in cooking. It just makes cutting so much easier and fun! 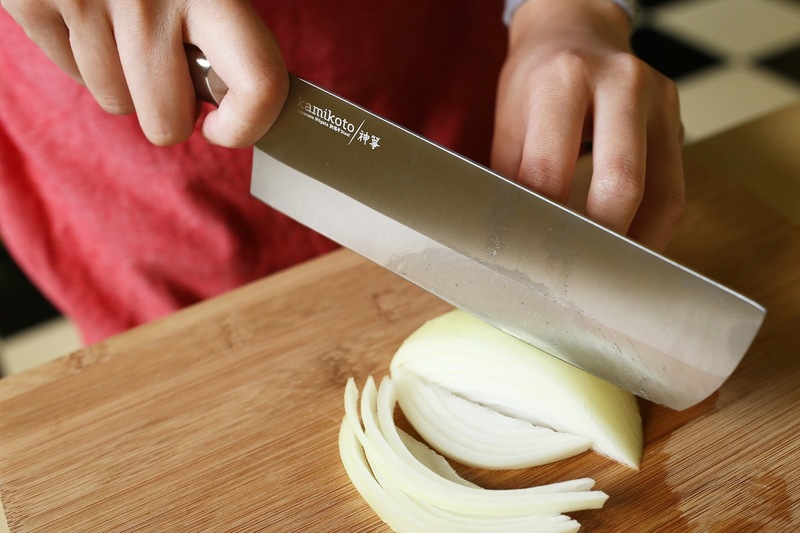 I absolutely love these knives because they are designed in a way so that you can use them effortlessly and precisely. Let me show you what I did with these knives! Once unpacking, I couldn't be more impressed with its knife wooden box. It looks very unique and sophisticated with their company name engraved on box cover. 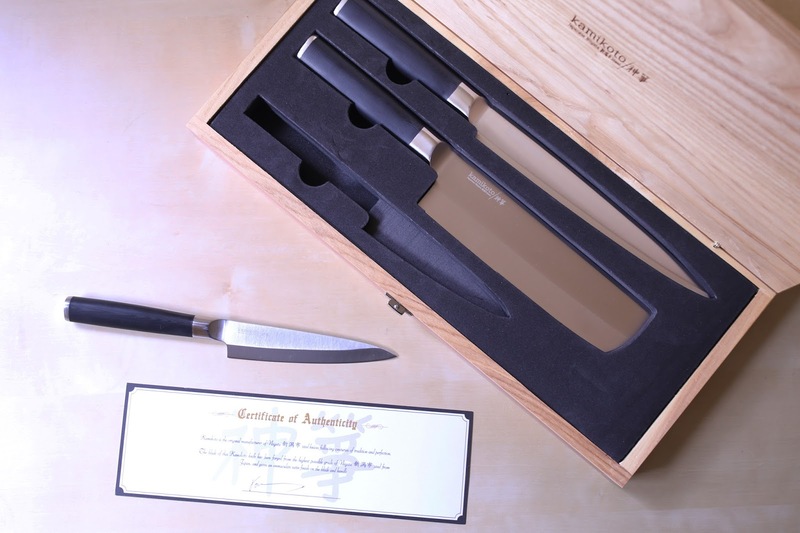 When you open the box, you will find a "Certificate of Authenticity" for the knife set. Inside the box, there are these black spongy materials that keep the knives in place when storing them. For each knife, both handle and blade have a satin finish to create a soft glow. The handle is long and round, which provides a comfortable, good grip for my hand without any slipping problem. They are heavier than the typical knives, very sharp at the same time, which means I need less strength to cut. 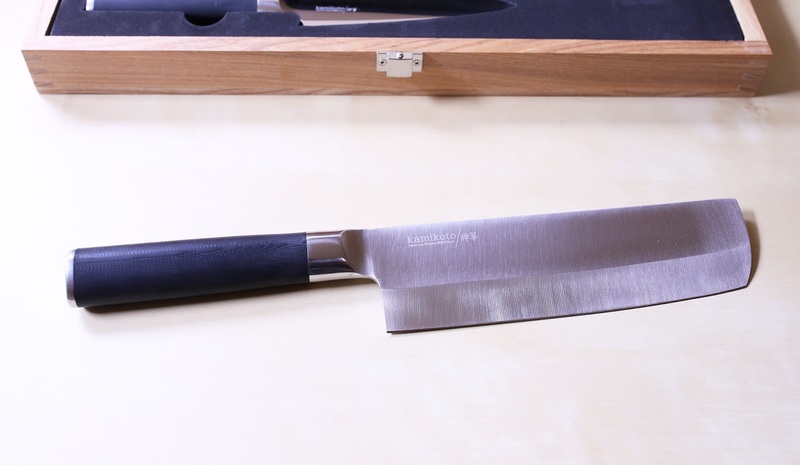 There are 3 knives in the Kanpeki Knife Set: a long slicing knife, a Nakiri vegetable knife, and an utility knife. The long slicing knife is great for slicing anything for me. It is 8.5 inches, long enough to cut larger vegetables like cabbage, lettuce, bell peppers, etc. Due to its long and curvy shape, it is great for mincing things like garlic, ginger, green onions, etc. 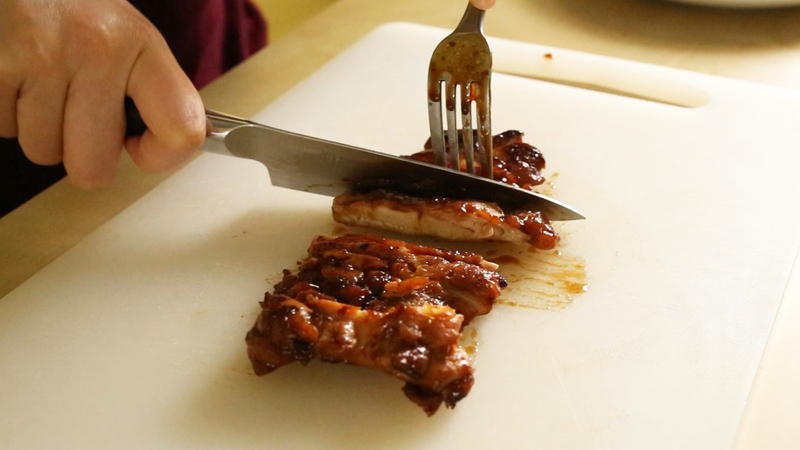 (See GIF below) The pointy end is good for making small cuts on raw meat before marinating them. Useful for cutting raw or cooked meat. 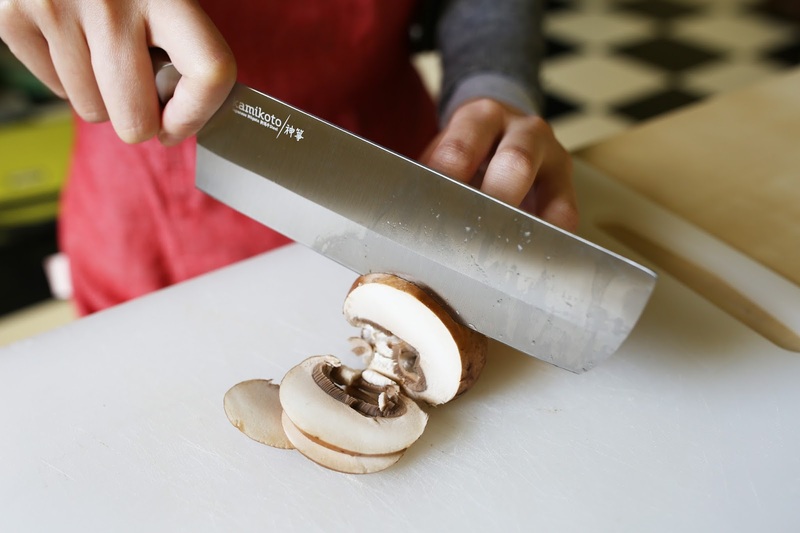 As the name suggested, it is great for cutting vegetables. 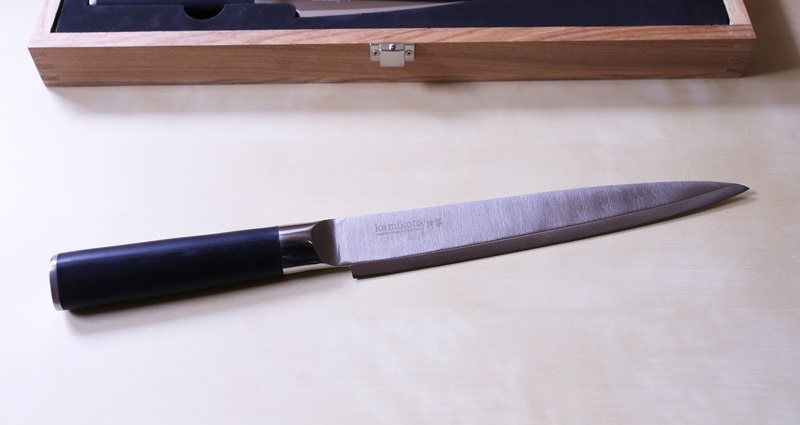 It is 7 inches long and is heavier than the slicing knife, which makes it a better fit for cutting harder vegetables like carrots and celery. The large blade is extremely useful for several things. Due to the larger area on the blade, it is logical to use it for cutting large fruit/vegetable like watermelons, squash, pumpkins, eggplants, etc. Use it to dice onions, tomatoes, or potatoes is good too. Lastly, I like to use the large blade to carry things to a bowl. The utility is a smaller knife that is only 5 inches long. Although it is the smallest knife out of all, it is lighter, more versatile, and the easiest to use. Most of the time, I don't have to cut anything extremely hard or huge. The utility knife can usually handle mid-size food. It is also uniquely perfect for more detailed tasks like unpeeling, scoring, or cutting something small like a lime or strawberry. I am extremely satisfy with my Kanpeki Knife Set. For most of the time, I can just grab any one of those knives and prepare my food. Cutting food used to be my least favorite part of cooking. I tended to ignore the quality of my knives and just go with whatever I have at home, which are these dull and old knives. Now, I actually enjoy cutting ingredients and can't wait to try out more recipes at home. Needless to say, these knives are very well-designed to work with the hand and the way you cut. It has a good amount of weight to keep it well balanced and make effortless cuts. Here's some chopping, dicing, and mincing I did at home. 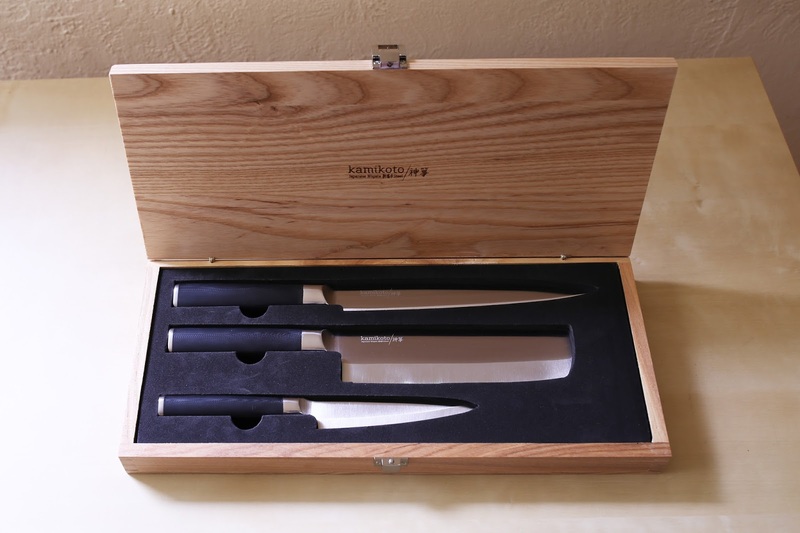 Click Here to order your Kanpeki Knife Set and get ready to love cooking again! Like I mentioned earlier, the company provides a limited warranty for lifetime for their customers. And if you are not satisfied with an item and need to return it, they are always there to help you with returning your purchase. Read more at their return & refund policy page. very great review of the knives, thanks for the link! Coo ! What king of Steel are these made from? Japan has some Realy great Knife Steels ! I think they have a discount price now. I am impressed by their knives too! They did, and I got a set, but I have not seen a posting of it anymore. It was limited time. The set cost about as much as one knife does! My breath caught when I saw these! I have been dreaming of owning such a beautiful set. I had the same feeling when I first saw the knife set too! They are too beautiful! Nice! It seems like you love to cook! Have fun! All my knives are cheap & barely work... can't imagine having a nice one! That's exactly what happened to me before. I love this knife set and feels great using them! An impressive looking knife set for sure. After I search it from Amazon, is it made in "China"? Most knives nowadays are made in china. The knife set you reviewed back in April, made me go look them up on Amazon. I am looking for some strong, well-balanced and well-made knives; these look like an option. Thank you for the review. These look really high quality, sharp and long lasting knives! There are some really cool blade making techniques in Japan ! These look like some beautiful knives. look like some beautiful knives. I really need a good set of knives, these ones look amazing. very useless review, please look up other knife review websites before taking something on for the first time. You need to talk about the blade, and handle , and the mterials, and dimensions, thickness, weight, durability, stain resistance, i dont think you are aware japanese knives use different much steeper angles than western knives, and you cannot sharpen them with most home sharpeners. 15degrrees angle's vs 30-45 degree angles on western knives. research is needed on your part. I just received a set of these knives. They appear to be Chinese manufactured, mass-produced knives. I go to Kyoto twice a year and have fine knives from Aritsugu and a couple of other shops in Japan. The Kamikoto knives are no where near that quality of my other fine knives. Kevin (above), you are mistaken about Japanese vs Western bevels, and in Japan there are many different ways of sharpening a blade. I agree, mostly, with your posting, but it is about as useless as your assessment of the review. My opinion, as a professional wood worker who sharpens daily and as an afficionado of Japanese tools and kitchen knives: These are not all that. Basic, decent kitchen knives. The claim of 1200bucks for a set is folly. I bet they have never sold a set for that price. Great review! I bought this set when they had an incredible deal! I should of bought more than one but I believe it was limited! Well balanced and sharp! Great box. I actually have not used them yet, almost afraid to take them out they are so sharp! I wish I had told others! Wish I had seen this deal everyone is talking about. I need new knives. These sound like great knives. Saw alot of post on facebook and was tempted to get one set. Did a little research and found out that kamikoto* is made in china and not japan. With the price (discounted), they won't tell you what steel, how hard, or anything about the grind? Better spent your money on real japanese kinfe. This is an excellent knife set. Kanpeki Knife Set is great choice for housewife and real chef. I know that it made by original Japanese stainless steel so it would be long lasting. Need more info you can visit this blog. That the Japanese is producing is excellent so I see that your knives are abundant! I wouldn't mind having a set of these knives in my kitchen. They look good both design-wise and utility-wise, but if I had to purchase Japanese knives I'd choose the ones in ceramic, they're really good! Scam and hype. The knives are made in China, they never disclosed what steel is used like D2, etc. Just a generic honshu steel which is just an island in Japan, never the specific steel, bevel, HRC number all important stuff that quality knives will publish so you know what you are getting. This company has a nice package and flashy website with nice words but no specifics hoping you will pay the extra price without asking too many questions.